Two snacks are provided free of charge by the school daily. Snacks are usually crackers, biscuits, fruit and vegetables with dip. Some parents send their own snacks which we would more than happy to feed your kids. However don't send too much otherwise they will spoil their lunch. Currently the school offers a catered optional extra cost ' Hot lunch' program 5 days per week. Parents can sign up for lunch on a daily basis at the school office or pay monthly. We encourage parents to pack a health home cooked meal. 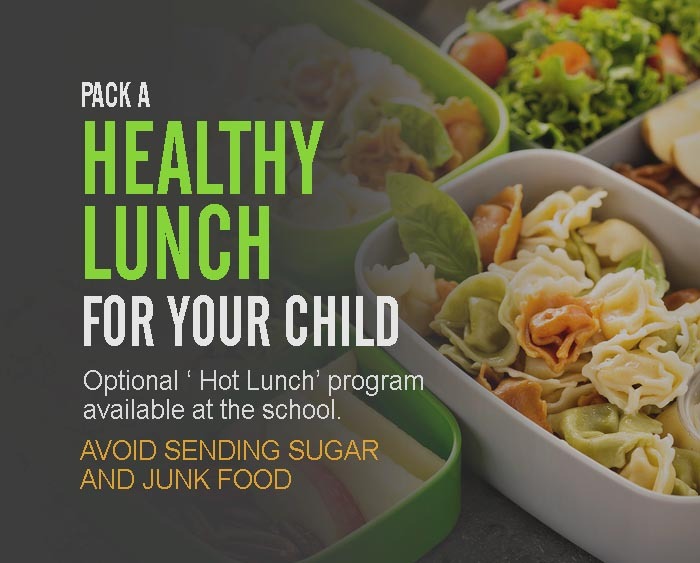 If you are packing a lunch at home, pack a well balanced, nutritional meal, excluding candy and other highly sugared foods with excessive quantities of additives, salt and preservatives. Nutritious foods include whole grain products, fresh fruits and vegetable and proteins. Chips, nuts and other chokable foods are not appropriate for infant/ Toddler diets. Please make sure your child’s name is clearly marked on lunch boxes and interior containers—which your child should be able to open and close. Lunches are to be packed in a container with the child’s name on it and need to include his or her lunch beverage. Avoid plastic bags! We are trash-free! Reusable containers that your child can open and close is the best. Lunch is a ceremonial meal at school, with several key lessons based on developing independence. We (every student in every class) compost, recycle, and reuse. We are glad to help plan and implement the introduction of new foods to your child. Each new food should be given at home for four days prior to use at the school. This will enable you to check for allergy or other negative reactions, other than dislike, such as vomiting. Please make sure that the care provider is made aware of the times and the amounts of food to be given. These guidelines were suggested by the school consulting pediatrician. Don't just pack anything for lunch. The best way to to do this to make a monthly lunch menu. Sit down on a weekend and think about what you will pack for your kid. By preparing and thinking about meals you can also save money. Quite a lot of money. Use only 100% juice. Look in the frozen section of smart and final. You will find frozen 100% juice. Mix with water, get a juice bottle and you are set. You can get other stuff too from Costco and Smart and final. Look for healthy stuff. Take a look at out our sample menu for parents. Due to severe allergies and hyper activity, we do not encourage peanut butter in our school. While it may not affect your child, it can have serious effects on other children possibly causing a life and death situation. Try to use Cottage cheese. Yes the Kids love it and it is high in protein. A quiet secluded private Preschool located in La Canada Flintridge offering a Montessori preschool experience. Established for over 30 years with the current owner and director.